Project Excelsior | Ballooning History Phoenix Arizona Hot Air balloon rides. Captain Kittinger was next assigned to the Aerospace Medical Research Laboratories at Wright-Patterson AFB in Dayton, Ohio. For Project Excelsior (meaning “ever upward”), a name given to the project by Colonel Stapp as part of research into high-altitude bailouts, he made a series of three extreme altitude parachute jumps from an open gondola carried aloft by large helium balloons. These jumps were made in a “rocking-chair” position, descending on his back, rather than in the usual face-down position familiar to skydivers. This was because he was wearing a 60 lb (27 kg) “kit” on his behind, and his pressure suit naturally formed a sitting shape when it was inflated, a shape appropriate for sitting in an airplane cockpit. Excelsior I : Kittinger’s first high-altitude jump, from about 76,400 feet (23,300 m) on November 16, 1959, was a near-disaster when an equipment malfunction caused him to lose consciousness. The automatic parachute opener in his equipment saved his life. He went into a flat spin at a rotational velocity of about 120 rpm, the g-forces at his extremities having been calculated to be over 22 times the force of gravity, setting another record. Excelsior II : On December 11, 1959, Kittinger jumped again from about 74,700 feet (22,800 m). 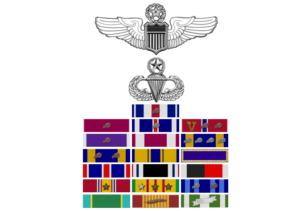 For this leap, he was awarded the A. Leo Stevens Parachute Medal. Excelsior III : On August 16, 1960, Kittinger made the final high-altitude jump at 102,800 feet (31,300 m). Towing a small drogue parachute for initial stabilization, he fell for 4 minutes and 36 seconds, reaching a maximum speed of 614 miles per hour (988 km/h) before opening his parachute at 18,000 feet (5,500 m). Incurring yet another equipment malfunction, the pressurization for his right glove malfunctioned during the ascent and his right hand swelled to twice its normal size, but he rode the balloon up to 102,800 feet before stepping off. Kittinger, jumping from the balloon gondola Excelsior III at 102,800 feet. Kittinger set historical numbers for highest balloon ascent, highest parachute jump, longest duration drogue-fall (four minutes), and fastest speed by a human being through the atmosphere. 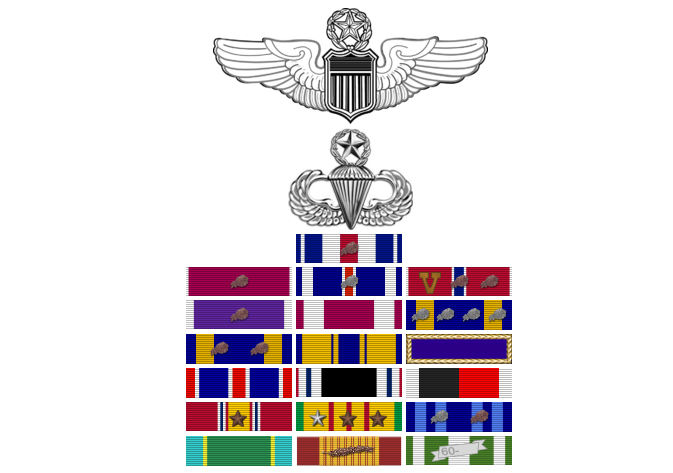 These were the USAF records, but were not submitted for aerospace world records to the Fédération Aéronautique Internationale (FAI). Kittinger’s record for the highest ascent was broken in 1961 by Malcolm Ross and Victor Prather. His records for highest parachute jump and fastest velocity stood for 52 years, until they were broken in 2012 by Felix Baumgartner. 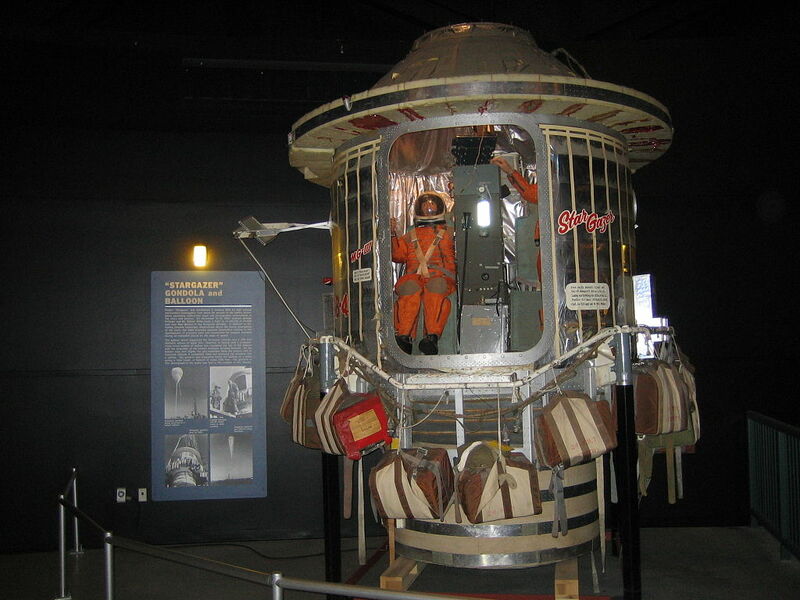 Stargazer gondola on display at the National Museum of the U.S. Air Force. For this series of jumps, Kittinger was profiled in both Life Magazine and the National Geographic Magazine, decorated with a second Distinguished Flying Cross, and awarded the Harmon Trophy by President Dwight D. Eisenhower. It appeared that Old Red would hold his records until Felix Baumgartner from Team Red Bull would approach him with his goals of beating old red’s high altitude record. Old Red being the modest man that he is, assisted him in beating his record. Old Red insisted that if this is to be done, it will be on his terms….. It would be done in a safe manner. Want to learn more about ballooning history? Come and take a hot air balloon ride with us!